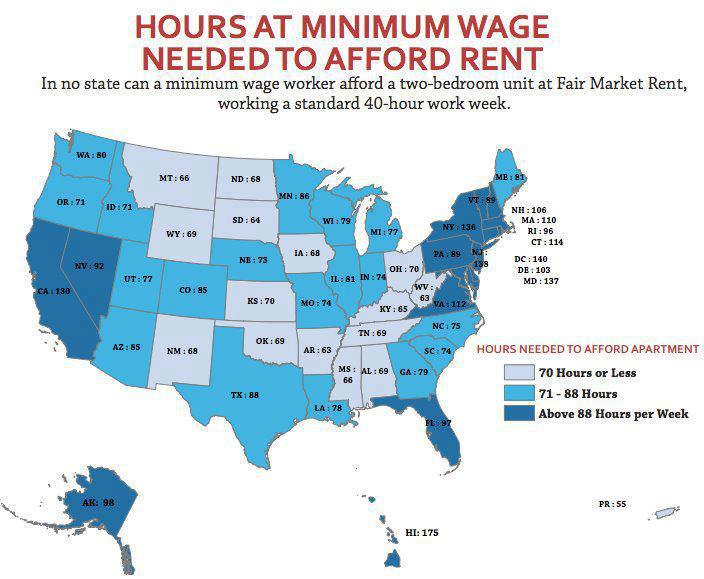 Nice bit of analysis here on how far the minimum wage goes doesn’t go relative to “Fair Market Rents” (about the 45th percentile of the rental distribution in each area)—h/t: RK. A more nuanced view would include the Earned Income Tax Credit, a critically important wage subsidy for working parents with low-incomes that can add over $5,000 to family income. The anti-minimum wage crowd likes to argue that we don’t need a min wage when we’ve got an EITC. But the magnitudes of the shortfalls shown in the figure—which of course only covers housing; there’s food, health care, etc. too)—show that we need both. They’re complements, not substitutes. Share the post "Minimum Wage and the Family Budget"
6 comments in reply to "Minimum Wage and the Family Budget"
The three expenses whose level is so intertwined with the possibility of class mobility. I’d be terribly interested in seeing what the equivalent map would look like for the year 1973 for these three aspects of life versus what it looks like today. I suspect it would be rather staggering. I checked 1983, The HUD data I found only goes back that far. The rates are very close to the same in the few metro areas I sampled. I imagine you will find variations in this depending on local conditions, but its no college tutition costs level of inflation. Growing up, I remember the choice between rent and coal. We had to pick rent, and put up with a little heat from the stove for a few days until we could manage $30 for a ton of coal. A glass of water froze overnight. Do the elite have a clue? Your link goes to Cafemom.com. A better link would be to the full report itself: http://nlihc.org/oor/2012. And the link to Up with Chris Hayes goes to the same previous Larry Kudlow piece.